Yesterday was pretty much shot after I went to the Arts Council. I spent the rest of the day working downstairs knocking a hole in the floor to get rid of the old water inlet pipe and then repairing the hole. So today I got back in the workshop to finish up some things from Monday. These tall footed bowls got cut. The ones on the left will get birds tomorrow. Small ovals got bottoms and handles today. Same with this big oval. 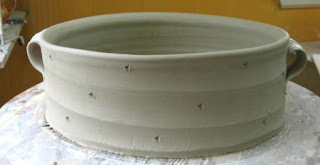 I am still waiting on some bigger bowls to dry for footing, so maybe get to those tomorrow. Sarah called at lunch and I was happy to get out of the shop to go out with her for a bite to eat. I miss having her at home. My work day ended at 4pm in order for me to get ready to drive to Charlotte for our Circle of Eight meeting. I am looking forward to seeing my clay pals.